Looking for a way to make a real difference in one child’s life? 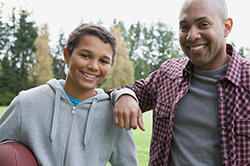 Join our Friends First Mentoring program, which matches a child — one-one-one — with a well-trained volunteer mentor. Donate to Mercy Home now! The organization Young Hearts for Life returned to our West Loop Campus on Saturday, January 12, to provide free heart screenings for our young men and women, including those in our Friends First mentoring and AfterCare programs, along with coworkers and children of coworkers who are under 25 years old. The group provided a total of 44 tests. Young Hearts for Life provides electrocardiograms for young adults all over Chicagoland to detect possible cardiac conditions that could put them at risk for a cardiac catastrophe, such as fainting or even sudden cardiac death. Volunteers are trained to administer EKGs and the results are read by the founder and medical director of the organization, Dr. Joe Marek. This round of testing was sponsored by the organization’s Junior Board, which is made up of 54 high school students from 15 different schools. After holding a fundraiser, they voted to use the funds to provide testing at Mercy Home. About 20 of those students came to our Home to volunteer and even administered some of the screenings. The Junior Board was started by the son of Dr. Marek and his wife, Kathy, who also is part of the organization. “It’s an amazing group of kids and they work so hard,” Kathy said. The Junior Board is only part of the organization, which, in addition to providing free heart screenings, also facilitates a bereavement group for families, provides education around cardiac health, and works with schools to create emergency action plans in case of a cardiac emergency of one of their students. The Mareks first heard of Mercy Home over 20 years ago and have been donating ever since. We are grateful they have expanded their commitment to our kids by providing these tests! Thank you everyone at Young Hearts 4 Life who donated their time and talents last weekend to make sure our kids stay healthy! © 2019 Mercy Home for Boys & Girls. All rights reserved.